We gave you our personal observations. 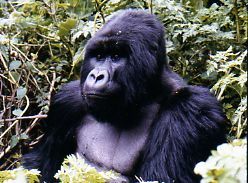 Our guest writer Irina knows a fair amount about Mountain Gorillas and Tropical Rainforest Animals in general. We shared our story about Ndume, "our" silverback gorilla. Mountain Gorillas inhabit the mountainous tropical rainforests of Eastern and Central Africa. They live in Rwanda, Uganda and the Democratic Republic of the Congo. ...and not aggressive towards people unless improperly disturbed. These animals are vegetarian (they eat shoots, leaves, fruit). They provide important ecological services in their rainforest communities by dispersing the seeds of fruits and plants that they consume. Mountain gorillas cannot swim but they can use tools to solve problems. For example, they have been seen using a tree branch as a bridge to cross a patch of muddy ground. Gorillas are social animals, and live in groups of 6 to 30 individuals, with a home range of 2 – 40 km (while ranges of different groups may overlap). The female gorilla gives birth once every 4 years, usually to a single baby but sometimes to twins. These animals are famous for their repertoire of calls which include grunts, hoots, the roar as well as the chest beating ritual. Mountain gorillas are among our closest relatives – they share at least 97% - 98% of their DNA with the human race. Mountain Gorillas have become an extremely endangered gorilla species, mainly due to human-induced causes: habitat loss, commercial hunting / poaching, diseases as well as military conflicts. There are now only around 600 – 640 individuals left in the wild. The conservation program for mountain gorillas that was launched at the end of the 1970s – beginning of the 1980s has been quite successful in stemming the total demise of these animals. And this slow reproductive rate makes gorilla conservation efforts even more important than ever before. If you want to find out more about tropical wildlife and rainforest conservation issues, please feel free to visit our Tropical Rainforest Animals website. Travelers need all the information they can get. As a post script, we should tell you that since she sent this, Irina has shut her website down and we cannot send you there for more mountain gorilla facts. Conservation efforts seem to be helping with Mountain Gorillas though. From what we've heard, their numbers are slowly increasing. And though it's been several years since we went our our gorilla trek, people we have talked to who have been more recently have been just as inspired by these amazing animals as we were. Many Africa Animals Are Endangered! We just wanted to add that gorillas are not the only animals in Africa that are endangered. Conservation efforts are crucial if we are to save rhinos, elephants, cheetahs and others. There are many groups that work at this. Please contribute in any way you can.... even if it's only getting the word out so more people speak up. And we've been lucky enough to visit with "cheetah ambassadors" in Namibia. We hope these amazing animal can survive far into the future. Thanks for letting us lecture a bit! International Travel Health Vaccinations Is the Water Safe? Do You Need Malaria Pills?